Panaji: Goa minister Vijai Sardesai today said the goodwill earned by Congress president Rahul Gandhi after calling on ailing Chief Minister Manohar Parrikar was “nullified” by certain statements made by him post the meeting. Sardesai said Gandhi’s gesture was nullified due to his “political gimmick”, which was unfortunate, and that the Congress president’s “utterances later made him look small”. 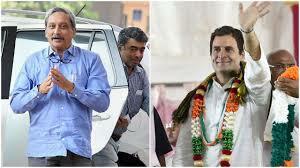 Hours after meeting Parrikar, who has been suffering from a pancreatic ailment, at the Goa Assembly complex in Panaji Tuesday, Gandhi said in Kochi that the former defence minister told him he had nothing to do with the ‘new’ Rafale fighter jet deal. Sardesai said they had earlier appreciated Gandhi’s move to meet Parrikar as a good gesture. “But after that the statements he gave indicated it was a political move,” the town and country planning minister told reporters here. “I myself had appreciated Gandhi’s visit. It looked to be a magnanimous s gesture but now it appears there was a vested political interest behind it because of his utterances, that makes his whole gesture look small. That also makes him (Gandhi) look small,” he said. Parrikar, in a strongly worded letter, had on Wednesday accused Gandhi of using his courtesy visit to him for “petty political gains”, asserting that there was no mention of the Rafale issue in their five-minute meeting. Later, Gandhi wrote to Parrikar, saying he did not share any details of their meeting in Panaji and only referred to what is already in the public domain on the Rafale deal in his speeches after the interaction.